If you don't need the length, you can choose to have it cut in half at 36" or at 46" to save on shipping. Choose one of the packing methods below whether to cut into 2 3 foot pieces or leave the piece in its 6 foot size. The associated packing material charge for the method chosen will be added when we process your order. You can put multiple Zinc, Brass, Copper, Re-bar and Wood framing pieces in that same packaging to make the most of the packing charge. See more shipping information at the bottom of the page. Cases cannot be cut in half. This method has an $4.00 boxing charge per box for materials used to ensure the product arrives in tact. There is no UPS additional charge for this method. This method has a $6.00 boxing charge per box for materials used to ensure the product arrives in tact. UPS will tack on another charge for oversized box (about $10.00 plus a $5.25 surcharge). This charge applies to cases also. 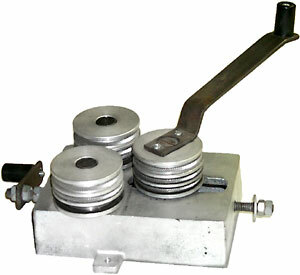 A tool for cutting a perfect 45° or 90° notch in both sides of a single sided 1/8" U channel at the same time with a simple push on the handle. The notcher has a adjustable head to accept U channels from 2 mm to 5 mm channel width and .015 in depth. No need to solder each corner of a box or frame anymore. The notcher is not designed to notch borders or H's channels. This hand tool is strength & versatility! The machine will bend zinc, brass and copper into circles or ovals without kinks. The came bender will bend the border channels, flat H's, and round H's in the three separate groves of the tool. Will make circles from 3" and larger. No need to change rollers one set does it all! Comes in 2 types, one for Chicago Metallic Came and the other for Cascade Came. All Framing, Brass, Zinc, Copper, and Rebar come in 6 foot lengths. At your request, we can cut them to save you shipping cost. - $ 6.00 boxing charge. We affix a wooden board to the outside of the the 75"x5"x5" box to make it sturdy and safe for carrying. - UPS charges an additional $ 9.00 oversized handling fee plus a $3.80 surcharge, then the cost of the actual box weight. - $ 4.00 boxing charge which includes a 3ft board to prevent bending during shipping. - UPS only charges what this box actually weighs. No additional handling charge. Remember: If you don't need the length, ask to have it cut in half. Also, combine the Oak Framing with your Lead Came, Zinc, Brass, Copper Channel, & Re-bar orders for your most economical shipping. Cases cannot be cut in half.